Above: The Dampier Cocktail garnished with half a finger lime on the rim. During the Experimental Mixing Symposium this past Saturday, a good number of drinks were made by the students using some relatively-unusual citrus that I had on hand. The two species that made the biggest impression were Citrus junos (or, more accurately Citrus ichangensis x. Citrus reticulata), the yuzu (or Japanese citron); and Citrus australasica, the finger lime. Bottled yuzu juice also lasts at good quality for much longer than lemon juice. The bottle we used on Saturday was opened eight months ago and was still absolutely delicious. Here is the recipe. Click on the image to enlarge it. If you get together the ingredients, I guarantee that you will love this drink — and that it will blow away anything made by some professional ‘bar creature’ with his infused arugula syrup and oily walnut bitters. Now, from all of the rare citrus drinks made this last Saturday, two really stood out for me. The first one I call the Dampier Cocktail. I imagined it and, tasting it with my mind’s tongue, suggested it to the students. It is nothing more than a Gin Cocktail accented with the tart finger lime. We tried it with twice as much finger lime and it was good, but somehow the flavor of finger lime went from an interesting and unusual accent to a less interesting lime hammer. 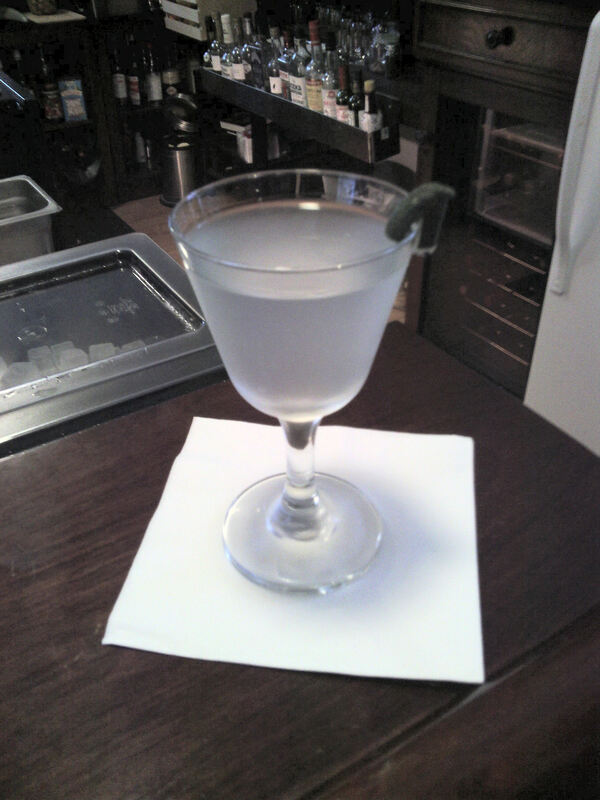 Imagine a vaguely finger lime version of the sour known as the Gimlet, and that’s about what it was. I preferred the true cocktail version. Here it is. Click on the image to read the naming logic in the note below the drink. Another good drink was made by student Rachel Blum. It was the Yuzurinha — a Caipirinha with yuzu instead of lime. I expected that to be good, and it was. But, the drink that surprised me by being so delicious was the result of student Chris Hain’s inspiration to make the Oxford Milk Punch with yuzu instead of lemon. I suggested that Chris use honey mandarine (in season now and on hand on Saturday) instead of the orange juice in the Oxford Milk Punch. This drink was truly good. 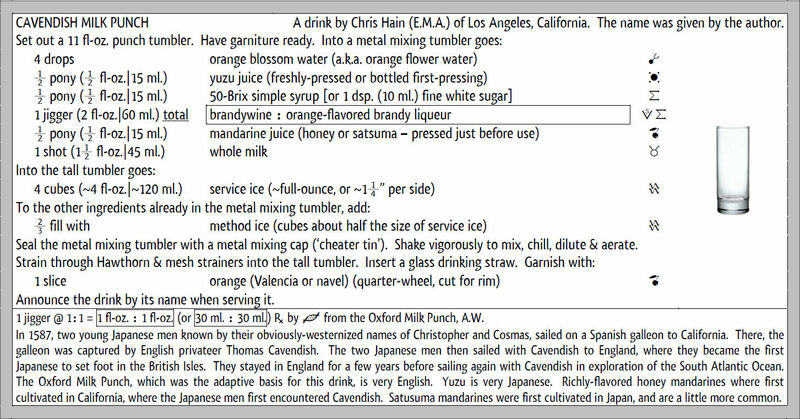 I call it the Cavendish Milk Punch for reasons legible in the notes below the recipe if the image is clicked on. I have kept the Salvation Sour to my courses since December and really thought about not sharing any of these newer drinks with a wider audience. I don’t like it when hard-to-find ingredients become even harder to find! But, these drinks are just so damned good that I could not justify keeping them from anyone. Those of you who bother to get the ingredients and make these drinks will discover why they must be shared. I am routinely asked where one can get drinks like those made in Elemental Mixology Courses. This might not answer that question exactly, but I have posted a list of bars (or restaurants with bars) where Elemental Mixology alumni or friends make drinks or manage.